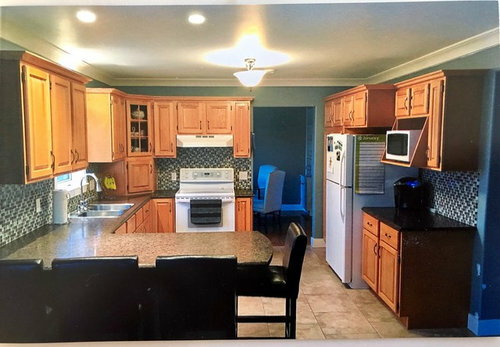 We began a kitchen renovation in April 2017 and finally in January 2018 I think all the odds and ends are completed and we are DONE! The footprint of our kitchen has remained the same, with the exception of a little tweaking here and there. The ceramic tile was just a few years old, so remained in place. 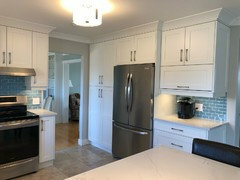 Our 20 year old honey oak cabinets and appliances were donated to Habitat for Humanity (I highly recommend them), and shaker style cabinets installed in a warm white colour. Quartz countertops with subtle grey and taupe veining were chosen to pick up the same colours that are in the floor tile. 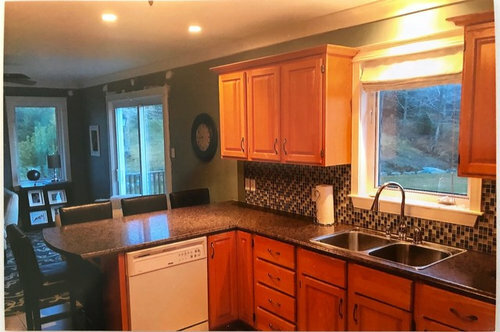 New (smudge proof) stainless steel appliances, sink, faucet, and decorative items complete the kitchen. 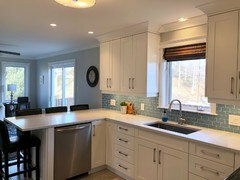 Our favourite part is the grey-blue glass backsplash. We live in Atlantic Canada with a view of the ocean, so we wanted our kitchen to feel a bit coastal, without it being kitschy. 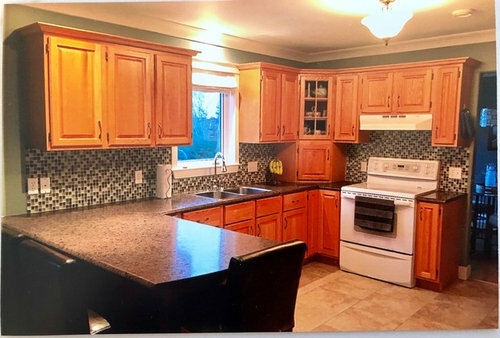 I also wanted a white kitchen to lighten up the room (it faces Northeast), but with a little colour and warmth. I think we’ve achieved the look we were after!This is a small scale renovation by some of today’s standards, but it’s perfect for us and is a joy to prepare meals for family and friends in. 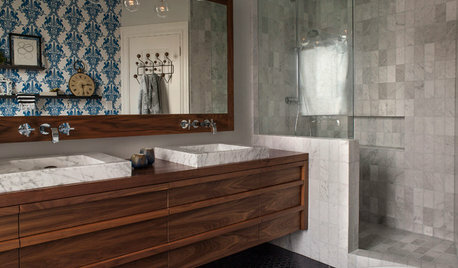 Thank you to everyone on Houzz who provided advice and comments when we began this process. 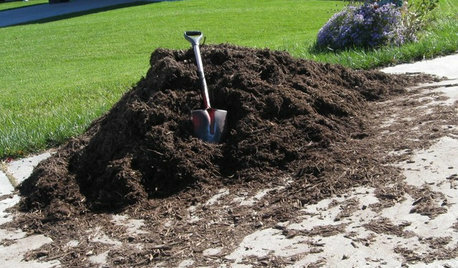 It made the project a whole lot easier! This is so pretty! I love the way you accessorized with just a few stylish and useful items. The tile is just beautiful. One question ...did you and the previous posters consider new, lighter bar stools? That would put this makeover right over the top! Thank you for the compliments! New stools are next on the list-I’d like to get less chunky ones with a lower back to visually open up the space a bit. Beautiful work! 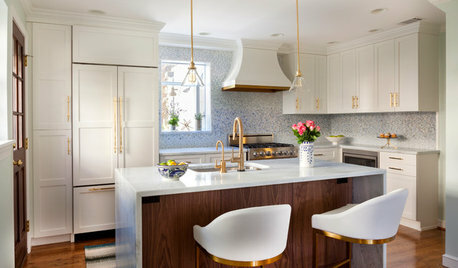 The backsplash is a tasteful ode to ocean view. Thank you! 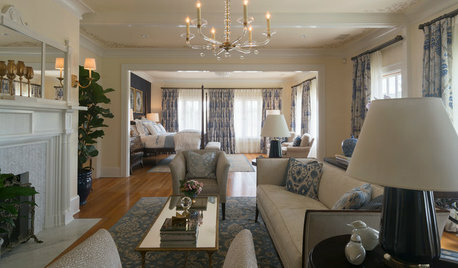 There wasn’t a whole lot of love for the blue tile on Houzz when I first presented the idea, but there’s a lot of blue in the adjoining family room and it ties the two spaces together nicely, in our opinion! Congratulations Pdjh, what a beautiful space, I love it. We have almost the same kitchen, lol. Our recent reno wasn't huge either, although it felt mammoth at the time! Enjoy your new digs! @Tracy; washing dishes in the bathtub any longer than one day makes any kitchen renovation feel like it’s lasting a lifetime! Enjoy your new digs too! @schnable; no more cleaning the tops of cabinets! Hooray! 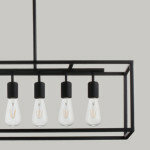 Clean, modern, and beautiful! Amazing work. The blue tile makes it perfect. You're a trend setter. Nice job. Thank you all so much for the positive reinforcement! Just wondered where you put your microwave. I am getting ready for a Reno, and this is one of my delimas? What's going on in the inside corners of your crown molding? What brand cabinets did you go with? 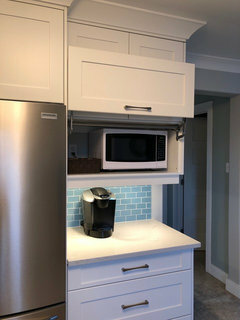 @Jacqueline: the microwave is behind the rectangular pop-up door above the Keurig. 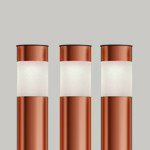 We didn’t want the type above the range, and I was searching for a way to keep it hidden. Found this gem of an idea on the internet! 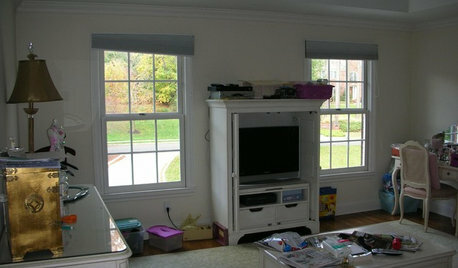 @Matt; our existing crown moulding did not match up exactly with the dimensions or style of the crown used over the cabinets. The solution created by the cabinet makers was to place this triangular block piece where the two trim pieces meet. The cabinet maker we hired was Traditional Cabinetry, but I believe the cabinet doors came from another company they deal with. They are coloured matched to Benjamin Moore’s “cloud white”. It's beautiful! Love the blue! Beautiful remodel. Love the backsplash color. Very pretty! I don't mind your stools as they balance out the black of your stove. Enjoy your new kitchen! Wow, stunning!! 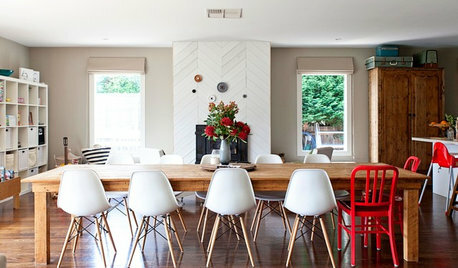 I like the stools the way they are! 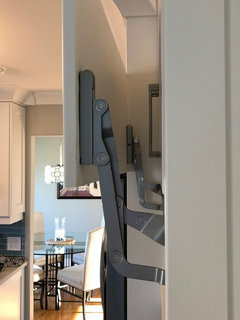 @pdjh...Could you send a photo that better shows the microwave garage hardware and and how it's attached to the cabinet and door? You kept the same floor. 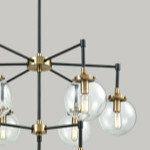 That saved some good money, and it looks great with your beautiful new kitchen. Good thinking. What a great change for a whole new feel! 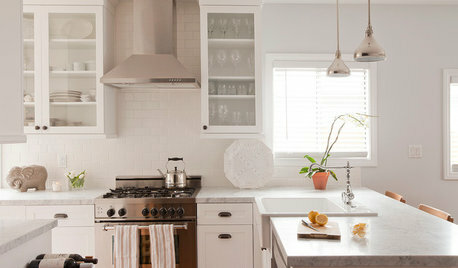 Love the appliances and backsplash with the light colors! Thank you for the compliments! 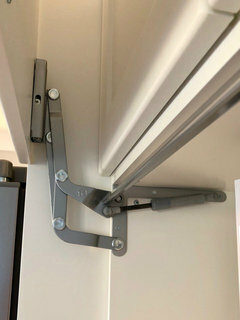 @Matt: here’s a couple more pics of that microwave cabinet hinge. Hope it helps! Beautiful kitchen. 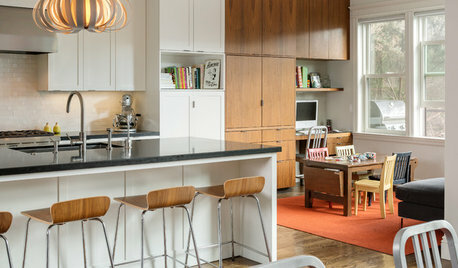 My kitchen is almost identical but no eat at peninsula (just cabinets below). Could you give me the measurements of your peninsula and also how useful you find it for eating/sitting there? That is a lovely update! So fresh and beautifully designed. Looks Fabulous! 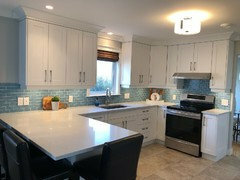 Love the blue backsplash! Thank you for all the kitchen love! @nosoccermom: the counter of the peninsula is roughly 76” x 38”. The cabinet underneath is smaller (there is a 12” overhang at the end and along the length where the stools are). We find it immensely useful! I wouldn’t have a lot of counter space without it. I use this area for almost all prep and most meals are eaten here too. With two kids in hockey, leisurely meals at the dining table are rare. Super easy to serve meals at the peninsula, and super easy clean up afterward. I am not a "blue" person, but this looks great! Beautiful!! Blue and white never gets old (in my books). 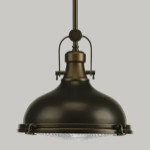 The floor looks greyer in the after shots - did you change your light bulbs? @tartanmeup: yes, we changed to daytime bulbs, also before and after pics were taken at different times of day. 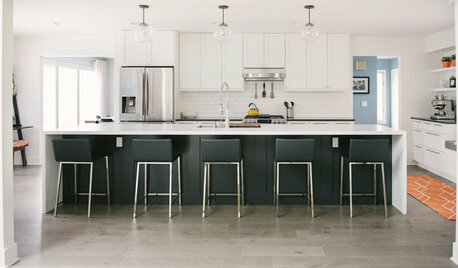 It's curious to me the individuality of both back splashes define this kitchen's allure to others. 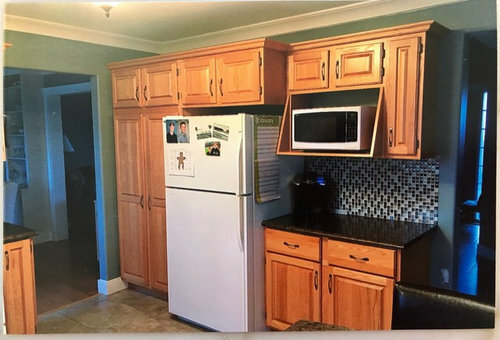 I love the way you filled the space above the cabinets. Very pretty! It must cheer you up, just walking into this kitchen. The blue tile is perfect! Beautiful transformation! The new space is bright and inviting! Really appreciate your response and will seriously look into the eat-at peninsula. Great work! 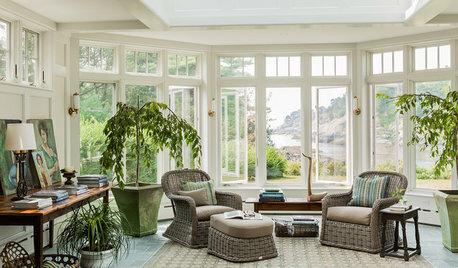 Love that -- coastal without the kitsch! It all looks very pretty. The microwave "secret" cabinet is my favorite. Gorgeous! Love the backsplash, the color is beautiful! 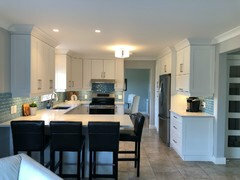 The shaker style cabinets look amazing! Water-based floor finish OK on top of Oil-based coatings ?